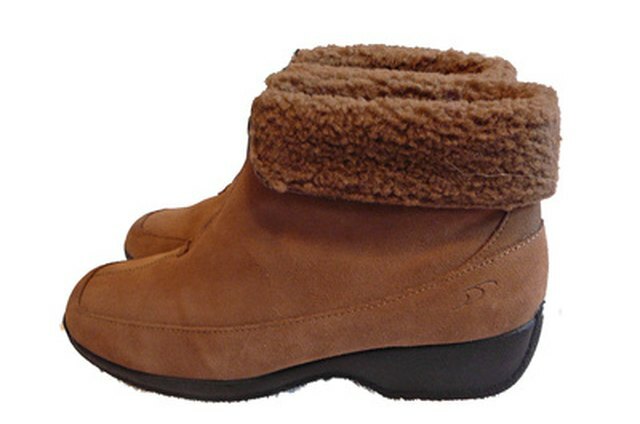 UGG boots are a brand of women's boots made of suede and sheepskin. While sheepskin is very warm, the boots' suede exterior is a type of leather that can get dirty and damaged quickly. The outside of brand-new UGG boots are usually quite stiff, but you can soften them to make them more comfortable. UGG boots also require conditioning to keep them clean, since suede can be difficult to clean once it is soiled. Rub the suede of your UGG boots in one direction with a suede brush to lift the fibers in preparation for the conditioner. 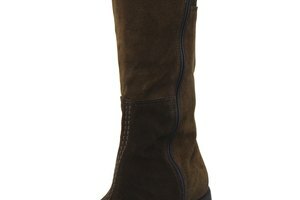 Spray a light silicone conditioner made for suede over the boots in a well-ventilated area. Hold the canister 12 inches away to get a fine mist all over the UGGs. Keep spraying until the boots look damp but not soaking wet. Use a blow dryer over the UGG boots to help the moisture sink in and condition the suede. This will make the material extra soft. Let the boots dry in a warm, dry area away from sunlight for 24 hours. Once dry, your UGG boots will not only be soft but should also resist most water and dirt. Rub the suede gently with a soft suede brush. Move the brush in one direction to lift the suede and make it fluff out a little. Do not wear your new UGG boots until you have conditioned them. Avoid wearing your UGG boots in the rain, since rain may damage the suede.